News flash: More lawyers are using social media! OK, we all knew that. But it’s always nice to see some numbers that give us a sense of where we are. The recently published 2012 ABA Legal Technology Survey Report on web and communication technology does that. Not surprisingly, the survey shows a continued rise in the number of lawyer blogs. Asked whether their firm has a blog, 22% said yes, up from 15% in 2011 and 14% in 2010. The attorneys most likely to say their firm has a blog are those in firms of 100 or more attorneys — 47% answered yes. By comparison, just 9% percent of solo lawyers said their firm had a blog. 8%, 100 or more attorneys. A topic of ongoing debate within the legal community is whether blogs generate business. 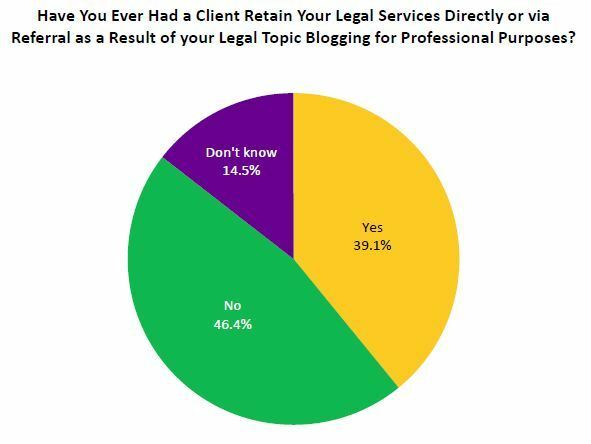 In the ABA survey, 39.1 percent of lawyers who blog answered yes to the question, “Have you ever had a client retain your legal services directly or via referral as a result of your legal topic blogging for professional purposes?” Among solo lawyers, 53.3 percent answered yes to that question. Of lawyers in firms of 2-9 members, 50 percent answered yes. Another 7% of lawyers said that they maintain a blog, but for personal, non-professional purposes. 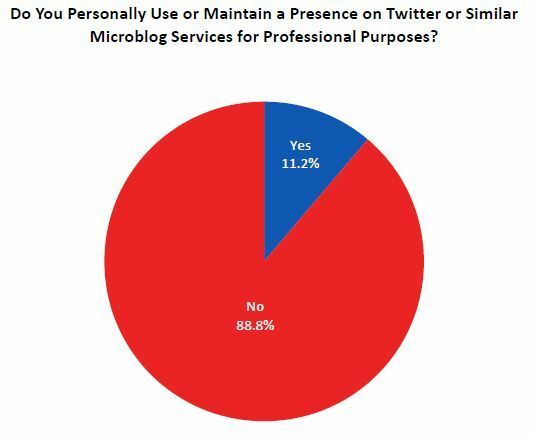 Lawyers were asked whether their firms maintain a presence on Twitter. Thirteen percent said yet, up from 7 percent the year before and 5 percent in 2010. Fully half the lawyers who answered yes to this question were in firms of 100 or more attorneys. By comparison, 10 percent of solos said their firms use Twitter. The survey asked lawyers which social networks their firms maintain a presence on. The chart below shows that 88 percent of lawyers said their firms are on LinkedIn and 55 percent are on Facebook. 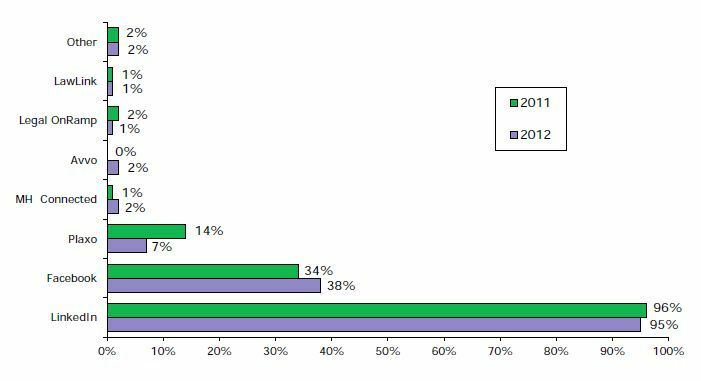 Meanwhile, firms reduced their presence on legal-vertical networks such as MH Connected and Legal OnRamp, the survey indicates. Use of Plaxo by firms dropped from 11 percent in 2011 to 4 percent in 2012. Personal use of social networks for professional purposes. Asked about their own use of social networks for professional purposes, 95 percent of lawyers said that they are on LinkedIn and 38 percent said they use Facebook. Use of the legal-vertical networks showed little change but indicates that only a fraction of lawyers use these. When asked why they maintain a presence in these social networks, the most common reason was career development and networking, an answer given by 72 percent of lawyers. The next most-common reason was case investigation (44 percent), then client development (42 percent) and education and current awareness (15 percent). Notably, 96 percent of lawyers answered yes to the question of whether they use a social network or online community for non-professional purposes. Ninety-seven percent of solos answered yes to that. The 2012 ABA Legal Technology Survey Report consists of six volumes, covering a range of topics from technology basics to mobile lawyering. The social media results are contained in Volume IV, which covers web and communication technology. Volume IV is available for purchase from the ABA for $350 (or $300 for ABA members). An abbreviated trend report on web and communication technology can be purchased for $55 (or $45 for ABA members).